Daniel Moshel wrote on his login2life blog about his visit in our newBERLIN Headquarter:"On the day of my departure back to Vienna I spontaneously met Jan and Tobias from ‘You in 3D’. If you are looking for a perfect representation of you, your business, or whatever in SL (or even better in virtual Berlin), here you find some pretty amazing guys who make anything possible you even can’t imagine. 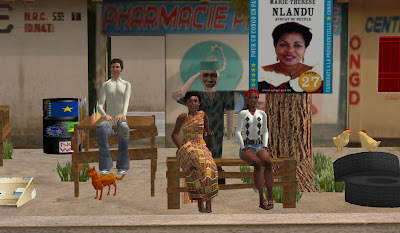 But they do more than just business in SL, they are enriching the cultural life of Berlin as well as in SL in organizing loads of events and programs, also intermixing all levels of perception possibilities. I was pretty amazed by her office. Mainly it is divided into two rooms: The first room looks pretty neat with oversized printouts of virtual Berlin plastering the walls. Here Tobias team are representing almost a white collar image. If you step through the narrow gangway to Jan’s working place you are entering a world you thought it exists just in movies. But see for yourself."